Friday, April 4, 2014, at 12:45 pm Eastern. 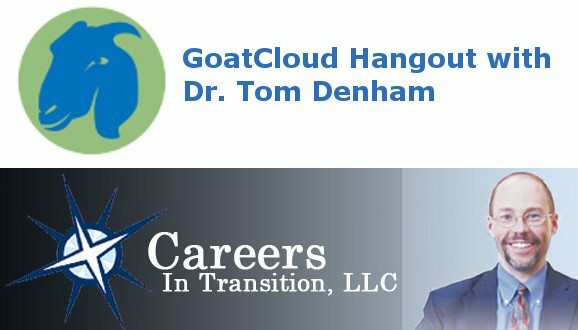 Topic: With Dr. Tom Denham, career transition guru, talking about deploying technology in general and social media in particular to run a small business and advance one’s career. Dr. Tom Denham talked about his approach to using technology and social media to enhance his small business. He also discussed how important it is for individuals interested in their careers to own their online presence, as that is where potential employers, associates, colleagues or business partners will turn to gather information about you. He offered many tips in our half-hour conversation, including break down tasks into small parts so they don’t seem so overwhelming, use LinkedIn (a lot), and don’t forget that you have to be networking in the physical world as well.